SEC Chairman Mary Schapiro alluded to the agency’s investigation of the alleged Imperia Invest IBC scam in testimony before Congress this morning, a development that may signal more bad news is in the offing for serial scammers online. In December, the U.S. Department of Justice noted that the Imperia case brought by the SEC in October was part of the operation. Imperia was promoted on Ponzi and criminals’ forums such as TalkGold and MoneyMakerGroup, both of which have been identified in federal court filings as places from which family-destroying international Ponzi and HYIP fraud schemes are promoted. Schapiro said today that the SEC has been aggressively pursuing “Ponzi scheme operators and perpetrators of offering frauds.” The Imperia case, which the SEC brought in Utah, is an example of an Internet-based offering fraud, as are many of the “programs” pitched on the Ponzi boards. In December, members of the Financial Fraud Enforcement Task Force identified Ponzi Scheme "hot spots" in the United States. 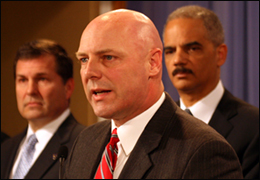 Pictured here are FBI Executive Assistant Director Shawn Henry (foreground), with Attorney General Eric Holder (right) and Chief Postal Inspector Guy Cottrell. The Task Force specifically warned investors to be wary of social-networking sites and chat forums. And officials noted that "we continue to use sophisticated investigative techniques—like undercover operations and court-authorized electronic surveillance—to collect evidence in ongoing cases and to identify and stop criminals before they prey on others." Salt Lake City was identified in December by the Task Force as one of the “top five Ponzi scheme hot spots in the country.” Other Ponzi hot spots include Los Angeles, New York, Dallas and San Francisco, the Task Force said, cautioning Americans that the fraud hardly was limited to those cities. “Be wary of people you meet on social networking sites and in chat rooms, where investment fraud criminals have been known to troll for victims,” the Task Force urged. In June 2010, the Justice Department used its Justice Blog to create awareness about the emerging threat of mass-marketing fraud, specifically referencing the alleged Pathway To Prosperity Ponzi scheme. Pathway To Prosperity, which the U.S. Postal Inspection Service said created tens of thousands of victims from virtually all corners of the world, also was promoted on TalkGold and MoneyMakerGroup. In October, before the public knew Operation Broken Trust was under way, the SEC said Imperia had stolen millions of dollars from thousands of Americans with hearing impairments. The firm used a payment processor known as Perfect Money, a favorite among international scammers who populate the Ponzi boards. Imperia also purported to have a relationship with Visa, but was using the name “without authorization” to disarm skeptical investors, the agency said. Not a “single penny” was paid to Imperia investors, the SEC said. Money from the Imperia scheme is believed to have been funneled into accounts in Cyprus and New Zealand. Imperia purported to have operated from the Bahamas and Vanuatu, but the business addresses were “fake,” the SEC said. Earlier this year, the CFTC turned its attention to purported Forex programs that were promoted on TalkGold and MoneyMakerGroup. Some of those programs also used PerfectMoney. Like the SEC, the CFTC is part of the Financial Fraud Enforcement Task Force. Be careful of any investment opportunity that makes exaggerated earnings claims, especially during a short period of time. Ask for written information about the investment, such as a prospectus, recent quarterly or annual reports, or an offering memorandum. Consult an unbiased third party, like an unconnected broker or licensed financial adviser, before investing. Don’t be fooled into believing an investment is safe just because someone you know is recommending it. So-called “affinity scams” are one of the favorite methods used to lure people in. If you feel you are being pressured into investing, don’t do it. Be wary of people you meet on social networking sites and in chat rooms, where investment fraud criminals have been known to troll for victims. I am an Italian cheated with Imperia Invest IBC program, what can I do to recover at least part of what I lost? I was defrauded by Imperia Invest IBC scam. How can I do to get my money back? How it is possible to get this scammers behind jail? I used to be member with Imperia Invest (IBC) and only paid was $61.00 and mailed to my team leader before he wired my $61.00 to other country or he may use my money so it is hard for me which one that he was purpose to wire my 61.00 to other country and then 6 months later got his e-mailed me again…..Asked for more money for Visa card to chose Platuim for $450.00 or $250.00 for Gold or $150.00 but I could not afford for those Visa card and I figured out that it must be SCAM and not worth to pay for Visa card at all. I need to know if I can file complain again my team leader for my $61.00 refund.. I was part of this so called investment with imperia invest. How can or who can I contact to claim any money that was invested, stolen with imperia invest. mike: I was part of this so called investment with imperia invest. How can or who can I contact to claim any money that was invested, stolen with imperia invest. I suggest you contact the SEC. I’m not sure if any recovery has been made.